Bollein Daki (in front) and his friends from the Kurenen age-set are able to move freely in the town of Pibor after the peace process. Before the peace, they were engaged in bloody fighting against other age-sets and were forced to hide out of town. Photo: Hugh Rutherford. Pibor was long known as the Wild West of South Sudan because of cattle rustling and age-set fighting. The effects of peace processes supported by FCA have enabled the town’s market to flourish and opened the people’s eyes to livelihood opportunities. 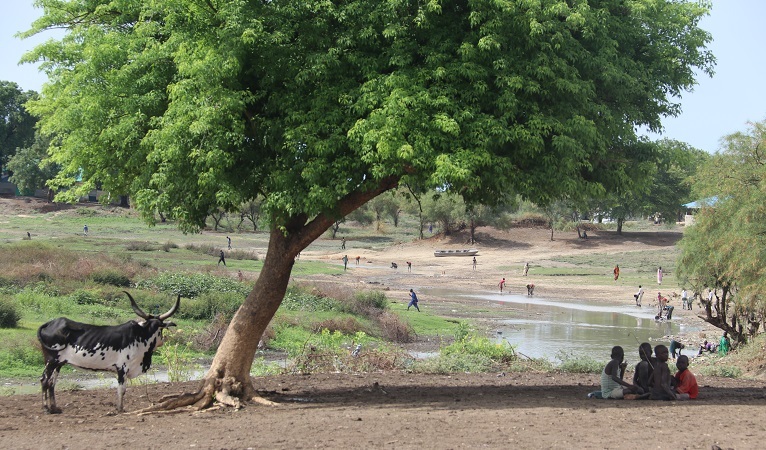 The rays of the evening sun caress the town of Pibor and inhabitants are washing themselves by the river at the end of a hot day. FCA’s finance administrator Moses Ludoru greets passers-by on his evening walk. His easy laughter is contagious. Ludoru is a familiar sight to locals, as his evening walk has become routine during peacetime. ”I want to stretch my legs and see what people are doing. There is so much new development here,” Ludoru describes. Women are digging the soil together. More and more are planting vegetables. Pibor’s marketplace is buzzing with people buying food and other items from the sheet metal shacks and clay huts. At a youth club, children are playing a football game on the television. ”Before, nothing was grown here, and we brought our food all the way from Juba. Now we can buy our food here,” Ludoru explains. Pibor is the main town of Boma State, nearly 400 kilometres east of the capital Juba. Boma used to be part of Jonglei State that has long been among the most restless regions in South Sudan. Ludoru’s work began quite literally with an empty desk. Armed men had cleaned out the previous office premises down to the chairs and desks when he settled in Pibor in early 2016. Organisations had evacuated their employees. The conflict was a sum of many parts, like poverty, food shortage, prevalence of guns, and struggle for power. When Ludoru arrived, the fighting was between the opponents and supporters of the governor at the time. “Before FCA started building reconciliation, people in conflict were more likely to reach for a gun than to engage in dialogue,” says Ludoru. Pibor is home to the Murle people, characterised by a hierarchy based on age-sets. Boys are born into a specific age-set distinguishable by name, colour and scar patterns traditionally made on the skin. One generation has an age span of 10 to 15 years. Traditionally, there comes a time for each generation to become decision-makers for their people, but since the war, the traditional rhythm has been compromised. ”Young people who have fought in wars at a young age want to have more influence and they might use violence to achieve it,” says Ludoru. We stop at a tea room at a sheet metal shack serving strong-flavoured ginger tea. A group of around 20-year-olds stand near the building. Their leader, Bollein Daki, has a bullet wound in his elbow. Daki represents the Kurenen age-set, or youngsters around 15 to 25 years of age. The Kurenen separated from the slightly older Lango age-set. Before that, the Lango had separated from the Bothonia age-set. The rifts among the youth have been deep. Bloody fighting ensued, forcing the Kurenen to retreat out of town. If Daki and his friends had shown their faces at the marketplace back then, the result would have been at least a fight. ”The fighting made farming impossible, and innocent people lost their property”, says Daki. The conflicts usually start with cattle rustling. Raising cattle is the main form of subsistence in the area, and the number of cattle is a symbol of status. Young adults need cattle in order to marry and start a family. The dowry sets a man back at least 50 cows. In a poor region, many decide to steal what they need, and the food shortage has also encouraged looting. Previously fights were resolved using sticks as weapons, but the war increased the number of firearms in the region. “The consequences were ugly”, says James Golla from the Lango age-set. The fights could grow to involve thousands of people. Daki and Golla reconciled the disputes between their age-sets in a peace process last year. The reconciliation was inspired by the FCA-supported peace between the tribes of Boma State and the peace between Boma and the neighbouring Jonglei State. In late 2016, FCA gathered the Murle of Boma and the Dinka of Jonglei for a peace meeting for the first time. The tribes reached a historic agreement on peaceful coexistence. The people of Boma State were granted permission to use the route to the capital Juba through Jonglei, making movement and trade easier. 40 leaders in key positions took part in the process between the states, and over 90 percent of those involved reported being satisfied with the results. Boma State has about 200,000 inhabitants. Last year, FCA gathered the Murle leaders of the state to reconcile their differences on political appointments in the state leadership. Traditionally, the disputes have led to fights for which the parties involved have recruited young age-sets. The strength of the peace was put to the test when a new governor took office again at the turn of the year – this time, under historically peaceful circumstances. For the first time in years, Boma State was spared any major violence. ”At first, I hated meeting the Lango, but now we are able to enjoy a meal together”, says Daki. Peace would not be possible without increased livelihood and education opportunities, says FCA’s peace officer Stephen Drichi. Now, people are able to pursue their goals without fighting. The age-sets have come together to learn skills such as fishing, baking and cooking. Now people from Pibor can find for instance fresh fish at the marketplace, in addition to dry food. ”We have also organised football tournaments for young people, with different age-sets playing together in mixed teams,” says Drichi. Before FCA arrived in Pibor, there were virtually no school buildings in the area, and education was not appreciated. The men made a name for themselves by fighting, and the women married underaged. FCA has built several temporary learning spaces in the Greater Pibor area, and last May, five larger school structures were completed. In addition, FCA has trained 60 volunteer teachers. The education project has reached over 4 000 children. The parents participate in the maintenance of the schools. The improvement in education has encouraged parents to also send their daughters to school, in addition to boys. Hellen Ajar sells tea at the Pibor marketplace and says that the youngest child of the family, Susan, 15, is allowed to continue with her studies all the way to university. According to her, girls used to be brought up just in the hopes of cattle. ”Susan’s sisters married young, just like I did at 14. There have been men asking about Susan, but I have told them no,” says Ajar. Education also strengthens peace. It increases the opportunities for work for children and youth and affects the survival of their families and communities. Young people are also offered peace education, providing them with tools for reconciliation and dialogue. In the reconciliation meetings themselves, the tools are a practical asset. According to Drichi, conflicts that arise can be dealt with quickly. ”The next step is to prevent all dangerous situations, but that requires long-term work,” he says.